Barnyardgrass (Echinochloa crus-galli var. crus-galli) is a monocot weed in the Poaceae family. 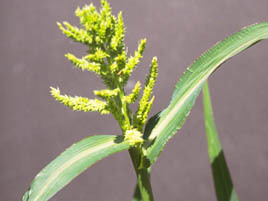 In Egypt this weed first evolved resistance to Group A/1 herbicides in 2009 and infests Rice. Group A/1 herbicides are known as ACCase inhibitors (Inhibition of acetyl CoA carboxylase (ACCase)). Research has shown that these particular biotypes are resistant to fenoxaprop-P-ethyl and they may be cross-resistant to other Group A/1 herbicides. Identification and Mechanism of Echinochloa crus-galli Resistance to Fenoxaprop-p-ethyl with respect to Physiological and Anatomical Differences. Amany Hamza, Aly Derbalah, andMohamed El-Nady. 2012. Identification and mechanism of Echinochloa crus-galli (L.) resistance to fenoxaprop-p-ethyl via physiological and anatomical differences between susceptible and resistant were investigated. The physiological and anatomical differences that were take into account were growth reduction, chlorophyll content reduction, lamina thickness, and xylem vessel diameter in both susceptible and resistant biotypes of E. crus-galli. The results showed that the growth reduction fifty (GR50) of resistant biotype was 12.07-times higher than that of the susceptible biotype of E. crus-galli treated with fenoxaprop-p-ethyl. The chlorophyll content was highly reduced in the susceptible biotype relative to the resistant one of E. crus-galli treated with fenoxaprop-p-ethyl. An anatomical test showed significant differences in the cytology of susceptible and resistant biotypes of E. crus-galli treated with fenoxaprop-p-ethyl with respect to lamina thickness and xylem vessel diameter. The resistance of E. crus-galli to fenoxaprop-p-ethyl may be due to the faster metabolism of fenoxaprop-p-ethyl below the physiologically active concentration or the insensitivity of its target enzyme (Acetyl-CoA carboxylase). Greenhouse trials comparing a known susceptible Barnyardgrass biotype with this Barnyardgrass biotype have been used to confirm resistance. For further information on the tests conducted please contact the local weed scientists that provided this information. There is no record of differences in fitness or competitiveness of these resistant biotypes when compared to that of normal susceptible biotypes. If you have any information pertaining to the fitness of Group A/1 resistant Barnyardgrass from Egypt please update the database. The Herbicide Resistance Action Committee, The Weed Science Society of America, and weed scientists in Egypt have been instrumental in providing you this information. Particular thanks is given to Aly Derbalah for providing detailed information.